The McGarrell Reilly Group and Business to Arts have unveiled a new piece of sculpture named ‘Rise’ by artist Alva Gallagher. Gallagher was commissioned to create the new artwork having been selected after an Open Call to Irish and international artists for ‘The Sharp Building Commission’. The brief to artists was to create an original and innovative sculptural installation in response to unique environment, architecture, historic and cultural references associated with the new building and its location off Hogan Place in Dublin’s South Docklands. 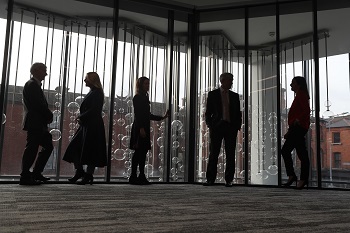 ‘Rise’ is a double-height glass sculpture that is visible from both the interior and exterior of The Sharp Building and can be seen by office staff, local viewers and commuters in the Docklands Area. Award- winning Irish sculptor, Alva Gallagher, is a visual artist whose work involves a continuous exploration of oceanic movements and elements. She is passionate about the sea and mirrors its ferocity and serenity through the manipulation of her chosen mediums (glass and bronze) from their molten to solid states to explore concepts of depth and rhythm. Alva has exhibited extensively. Recent highlights include the Royal Society of Marine Artists Annual Exhibition at the Mall Galleries, London; CAST at The Wayne Art Institute Philadelphia; The Traver Gallery Seattle, USA; and The Saatchi Gallery, London. Her work appears in State, National and International Collections, including The OPW, The National Museum of Ireland Collins Barracks, BMW and in the iconic ‘Gherkin’ building in the city of London.